January 17 is the 17th day of the year in the Gregorian calendar. 348 days remain until the end of the year(349 in leap years). 1287 – The Treaty of San Agayz is signed. King Alfonso III of Aragon conquers the island of Menorca from the Moors. 1524 – Giovanni da Verrazzano sets sail westward from Madeira to find a sea route to the Pacific Ocean. 1562 – France recognizes the Huguenots by the Edict of Saint-Germain. 1595 – During the French Wars of Religion, Henry IV of France declares war on Spain. 1608 – Emperor Susenyos I of Ethiopia surprises an Oromo army at Ebenat; his army reportedly kills 12,000 Oromo at the cost of 400 of his men. 1648 – England's Long Parliament passes the "Vote of No Addresses", breaking off negotiations with King Charles I and thereby setting the scene for the second phase of the English Civil War. 1773 – Captain James Cook commands the first expedition to sail south of the Antarctic Circle. 1781 – American Revolutionary War: Battle of Cowpens: Continental troops under Brigadier General Daniel Morgan defeat British forces under Lieutenant Colonel Banastre Tarleton at the battle in South Carolina. 1799 – Maltese patriot Dun Mikiel Xerri, along with a number of other patriots, is executed. 1811 – Mexican War of Independence: In the Battle of Calderón Bridge, a heavily outnumbered Spanish force of 6,000 troops defeats nearly 100,000 Mexican revolutionaries. 1852 – The United Kingdom signs the Sand River Convention with the South African Republic. 1873 – A group of Modoc warriors defeats the United States Army in the First Battle of the Stronghold, part of the Modoc War. 1885 – A British force defeats a large Dervish army at the Battle of Abu Klea in the Sudan. 1893 – Lorrin A. Thurston, along with the Citizens' Committee of Public Safety, led the Overthrow of the Kingdom of Hawaii and the government of Queen Liliʻuokalani. 1899 – The United States takes possession of Wake Island in the Pacific Ocean. 1903 – El Yunque National Forest in Puerto Rico becomes part of the United States National Forest System as the Luquillo Forest Reserve. 1904 – Anton Chekhov's The Cherry Orchard receives its premiere performance at the Moscow Art Theatre. 1912 – British polar explorer Captain Robert Falcon Scott reaches the South Pole, one month after Roald Amundsen. 1915 – Russia defeats Ottoman Turkey in the Battle of Sarikamish during the Caucasus Campaign of World War I. 1918 – Finnish Civil War: The first serious battles take place between the Red Guards and the White Guard. 1929 – Popeye the Sailor Man, a cartoon character created by E. C. Segar, first appears in the Thimble Theatre comic strip. 1941 – Franco-Thai War: Vichy French forces inflict a decisive defeat over the Royal Thai Navy. 1943 – World War II: Greek submarine Papanikolis captures the 200-ton sailing vessel Agios Stefanos and mans her with part of her crew. 1944 – World War II: Allied forces launch the first of four assaults on Monte Cassino with the intention of breaking through the Winter Line and seizing Rome, an effort that would ultimately take four months and cost 105,000 Allied casualties. 1945 – World War II: The Vistula–Oder Offensive forces German troops out of Warsaw. 1945 – The SS-Totenkopfverbände begin the evacuation of the Auschwitz concentration camp as Soviet forces close in. 1945 – Swedish diplomat Raoul Wallenberg is taken into Soviet custody while in Hungary; he is never publicly seen again. 1946 – The UN Security Council holds its first session. 1948 – The Renville Agreement between the Netherlands and Indonesia is ratified. 1950 – The Great Brink's Robbery: Eleven thieves steal more than $2 million from an armored car company's offices in Boston. 1950 – United Nations Security Council Resolution 79 relating to arms control is adopted. 1961 – U.S. President Dwight D. Eisenhower delivers a televised farewell address to the nation three days before leaving office, in which he warns against the accumulation of power by the "military–industrial complex" as well as the dangers of massive spending, especially deficit spending. 1961 – Former Congolese Prime Minister Patrice Lumumba is murdered in circumstances suggesting the support and complicity of the governments of Belgium and the United States. 1966 – Palomares incident: A B-52 bomber collides with a KC-135 Stratotanker over Spain, killing seven airmen, and dropping three 70-kiloton nuclear bombs near the town of Palomares and another one into the sea. 1969 – Black Panther Party members Bunchy Carter and John Huggins are killed during a meeting in Campbell Hall on the campus of UCLA. 1977 – Capital punishment in the United States resumes after a ten-year hiatus, as convicted murderer Gary Gilmore is executed by firing squad in Utah. 1981 – President of the Philippines Ferdinand Marcos lifts martial law eight years and five months after declaring it. 1991 – Gulf War: Operation Desert Storm begins early in the morning as aircraft strike positions across Iraq, it is also the first major combat sortie for the F-117. LCDR Scott Speicher's F/A-18C Hornet from VFA-81 is shot down by a Mig-25 and is the first American casualty of the War. Iraq fires eight Scud missiles into Israel in an unsuccessful bid to provoke Israeli retaliation. 1991 – Crown prince Harald V of Norway becomes King Harald V, following the death of his father, King Olav V.
1992 – During a visit to South Korea, Japanese Prime Minister Kiichi Miyazawa apologizes for forcing Korean women into sexual slavery during World War II. 1994 – The 6.7 Mw  Northridge earthquake shakes the Greater Los Angeles Area with a maximum Mercalli intensity of IX (Violent), leaving 57 people dead and more than 8,700 injured. 1995 – The 6.9 Mw  Great Hanshin earthquake shakes the southern Hyōgo Prefecture with a maximum Shindo of VII, leaving 5,502–6,434 people dead, and 251,301–310,000 displaced. 1996 – The Czech Republic applies for membership of the European Union. 1997 – Cape Canaveral Air Force Station: A Delta II carrying the GPS IIR-1 satellite explodes 13 seconds after launch, dropping 250 tons of burning rocket remains around the launch pad. 1998 – Lewinsky scandal: Matt Drudge breaks the story of the Bill Clinton–Monica Lewinsky affair on his Drudge Report website. 2002 – Mount Nyiragongo erupts in the Democratic Republic of the Congo, displacing an estimated 400,000 people. 2007 – The Doomsday Clock is set to five minutes to midnight in response to North Korea's nuclear testing. 2010 – Rioting begins between Muslim and Christian groups in Jos, Nigeria, results in at least 200 deaths. Year 38 BC was either a common year starting on Sunday or Monday or a leap year starting on Saturday, Sunday or Monday of the Julian calendar and a common year starting on Sunday of the Proleptic Julian calendar. At the time, it was known as the Year of the Consulship of Pulcher and Flaccus. The denomination 38 BC for this year has been used since the early medieval period, when the Anno Domini calendar era became the prevalent method in Europe for naming years. It was also the first year of the Spanish era calendar in use in Hispania until the 15th century. 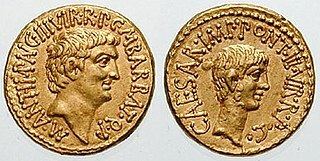 The Second Triumvirate is the name historians have given to the official political alliance of Gaius Julius Caesar Octavianus, Marcus Antonius, and Marcus Aemilius Lepidus, formed on 27 November 43 BC with the enactment of the Lex Titia, the adoption of which some view as marking the end of the Roman Republic, whilst others argue the Battle of Actium or Octavian becoming Caesar Augustus in 27 BC. The Triumvirate existed for two five-year terms, covering the period 43 BC to 33 BC. Unlike the earlier First Triumvirate, the Second Triumvirate was an official, legally established institution, whose overwhelming power in the Roman state was given full legal sanction and whose imperium maius outranked that of all other magistrates, including the consuls. Sextus Pompeius Magnus Pius, in English Sextus Pompey, was a Roman general from the late Republic. He was the last focus of opposition to the Second Triumvirate. His father was Gnaeus Pompeius Magnus. Year 1342 (MCCCXLII) was a common year starting on Tuesday of the Julian calendar. Year 1429 (MCDXXIX) was a common year starting on Saturday of the Julian calendar. Antonio del Pollaiuolo, also known as Antonio di Jacopo Pollaiuolo or Antonio Pollaiuolo, was an Italian painter, sculptor, engraver and goldsmith during the Italian Renaissance. Year 395 (CCCXCV) was a common year starting on Monday of the Julian calendar. At the time, it was known as the Year of the Consulship of Olybrius and Probinus. The denomination 395 for this year has been used since the early medieval period, when the Anno Domini calendar era became the prevalent method in Europe for naming years. Year 644 (DCXLIV) was a leap year starting on Thursday of the Julian calendar. The denomination 644 for this year has been used since the early medieval period, when the Anno Domini calendar era became the prevalent method in Europe for naming years. The Blessed Gamelbert was a Christian priest, who worked in the 8th century in the area of the present Deggendorf in Bavaria in Germany. Charles Gore (1853–1932) was the Bishop of Oxford. He was one of the most influential Anglican theologians of the 19th century, helping reconcile the church to some aspects of biblical criticism and scientific discovery, while remaining Catholic in his interpretation of the faith and sacraments. Also known for his social action, Gore became an Anglican bishop and founded the monastic Community of the Resurrection as well as co-founded the Christian Social Union. He was the chaplain to Queen Victoria and King Edward VII. Saint Anthony or Antony, was a Christian monk from Egypt, revered since his death as a saint. He is distinguished from other saints named Anthony such as Anthony of Padua, by various epithets of his own: Anthony the Great, Anthony of Egypt, Antony the Abbot,Anthony of the Desert,Anthony the Anchorite, and Anthony of Thebes. For his importance among the Desert Fathers and to all later Christian monasticism, he is also known as the Father of All Monks. His feast day is celebrated on 17 January among the Orthodox and Roman Catholic churches and on Tobi 22 in the Coptic calendar used by the Coptic Church. Blessed Angelo Paoli - born Francesco - was an Italian Roman Catholic priest and a professed member from the Carmelites. Paoli became known as the "father of the poor" due to his strong charitable outreach towards those who were poor and sick and he even received praise from a number of cardinals and other prelates while living in Rome. This extended to his friend Cardinal Saint Giuseppe Maria Tomasi and Paoli even received praise from Pope Innocent XII and Pope Clement XI who both offered him the cardinalate despite refusals. ↑ Anthony A. Barrett (4 January 2002). Agrippina: Mother of Nero. Routledge. p. 16. ISBN 978-1-134-61863-7. ↑ Philippe Levillain (2002). The Papacy: Gaius-Proxies. Psychology Press. p. 660. ISBN 978-0-415-92230-2. ↑ Kovačević-Ristanović, Ružica (2014-07-10). "Lela Mevorah: A Professional Jewish Woman's Contribution to the Practice of Medicine in Serbia in the Aftermath of the Holocaust". Serbian Studies: Journal of the North American Society for Serbian Studies. 25 (2): 199–211. doi:10.1353/ser.2011.0042. ISSN 1941-9511. ↑ Australian Media Guide : 2000 Paralympic Games Sydney. Sydney: Australian Paralympic Committee. 2000. p. 30. ↑ "Devlin DeFrancesco" . Retrieved 2 October 2018. Wikimedia Commons has media related to January 17 .